Are you feeling self-conscious due to varicose veins, spider veins, or aging skin? Central Florida Vein and Vascular Center may be the answer. 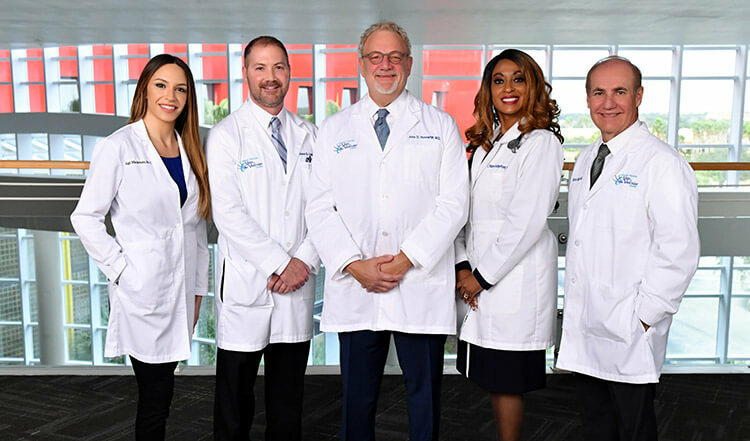 At Central Florida Vein and Vascular Center, the best vascular surgeons in Orlando are within easy reach at our Ocoee, Kissimmee, and The Villages offices. If you’re looking to reduce the appearance of your veins, brown spots, or facial redness, our physicians can help keep your skin in top shape through topical laser therapy. The procedure has no downtime and is generally quick enough to be completed during lunchtime. Patients experience no pain during the procedure, often describing the warming sensation as relaxing. Central Florida Vein & Vascular Center offers high-level care and high-level comfort from the second you walk into our office. We help determine what’s best for you by discussing all treatment options, ranging from homeopathic treatment to conservative compression stocking treatment to minimally invasive procedures. We’ll explain how other hormonal changes, such as pregnancy, can affect your venous health. For those looking for additional knowledge before they visit our clinic, we offer ongoing educational material through our blog. Throughout every step of the process, you’ll have an understanding of your venous care and what we believe is your best option moving forward. All of our procedures are minimally invasive. If the thought of treatment recovery time or cost is keeping you away from the vein care you deserve, don’t worry; vein care is more affordable than you might think. Most insurance companies cover an initial consultation, so you can gain a full understanding of your current venous health. If you have questions about Topical Laser Therapy or have other concerns about your veins, you can schedule a consultation with our specialists at the Central Florida Vein and Vascular Center. We’ll be happy to answer questions and address any concerns you may have about your vein care. You can call us at 407-545-3385 or 352-658-5547 today to schedule a consultation and take the first step toward healthier legs and skin.